Attract more candidates by posting to multiple free job boards with a single submission. It’s fast, easy and effective. Workable partners with the most popular paid job boards. Create targeted posts to fill your hiring pipeline with the best candidates. Set up your account and get access to Workable’s all-in-one recruiting software free, for 15 days. Create your job in Workable, and customize an application form for faster candidate screening. Select your free job boards and post with one click. Try Workable’s applicant tracking, free. This is great for those who post jobs on multiple sites and need something to ensure all the information is together in an easy to read format. Workable puts our postings on multiple websites with one click. It is easy to move candidates to different stages in the hiring process. Interviews can be coordinated and communicated easily in Workable. Workable is a fantastic product for internal recruitment teams, with a great UX/UI and workflow. It completes our company careers page, looks great and has already started to attract quality candidates to our openings. We really couldn't be happier! Talk directly to your biggest fans by integrating your company Facebook account with Workable. 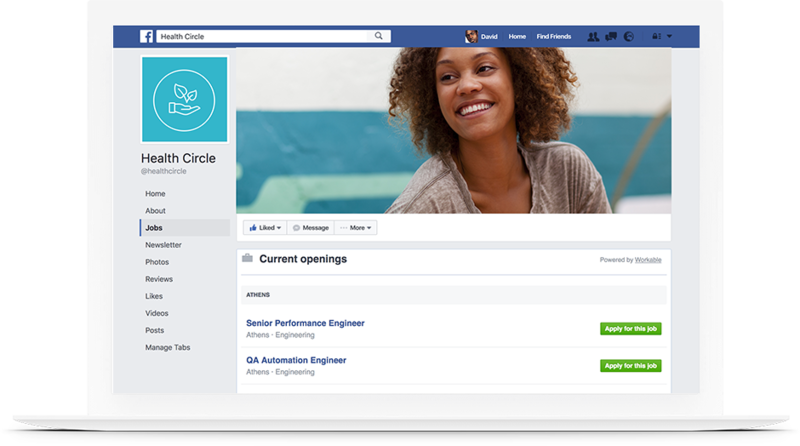 Create a free Facebook Jobs Tab to display your latest roles. There’s no coding required and it updates automatically every time you add or update a job in Workable. A branded careers site that auto-updates with each new role. Track and manage candidates with the most popular ATS. Evaluate candidates and schedule interviews on the go. Set up a hiring team for every job & gather feedback in one place. Discover the best performing job boards to improve your ROI.